SPOILERS for last night’s season two finale of The Flash on The CW. In an epic flashback to the 1990s Flash TV series and the DC Comics, the audience learned the identity of Zoom’s prisoner — The Man in the Iron Mask. It was Earth-3’s Jay Garrick, DC’s original Flash, played by John Wesley Shipp. The actor played Earth-1’s Henry Allen, Barry Allen’s (Grant Gustin) father, who was just killed off. Shipp, of course, also played Barry aka The Flash in the 1990 version of The Flash TV show, which was cancelled after one season on CBS. TV Line interviewed Shipp about the big reveal and talk turned to the 1990s version of The Flash and what it is like for him to play The Flash again. 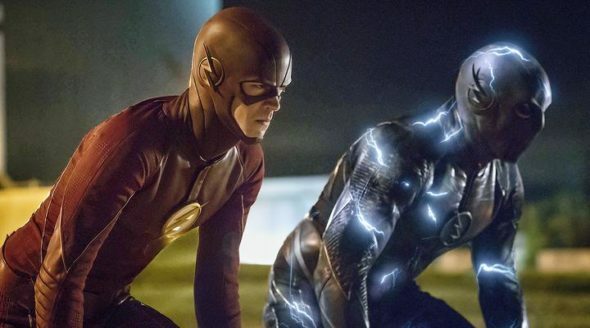 Reportedly, executive producers of The Flash TV series on The CW, Andrew Kreisberg and Greg Berlanti, and DC Comics’ Geoff Johns, were all fans of the original TV show. Shipp tells Matt Webb Mitovitch that the trio wanted to include him in some way. By casting Shipp as Henry, they were able to attract fans of the old series, but the Henry character also gave Barry a sounding board, where he could reveal his inner feelings about accepting the fact that he was a superhero. Shipp said he always knew Henry would be killed off, but he was “blown away” by the reveal that he was Zoom’s prisoner. TVLINE | If I told you 26 years ago you’d be wearing a Flash costume again, would you have believed me? I would not. I remember the last scene that Mark Hamill and I did out in southeast L.A. at 5 in the morning. I was in the Flash suit and of course he was being The Trickster, and I was so relieved to never have to put on the superhero suit again that I ripped the wings off and threw them in the air. Mark got those wings, and he still has them — it never occured [sic] to me to keep anything. But because it was such a grueling season — we had to do practical effects, we did not have the possibility of doing so much in CGI — I swore at that moment that I would never, ever get into another superhero suit ever again. Well, now 25 years older and 25 years wiser, I know never to make those kinds of statements! TVLINE | Had you been keeping tabs on this Man in the Iron Mask mystery? Were you aware of it at all? I was, yes, because I’m very fond of that cast. I got to be in the enviable position of being both a part of the show and a fan of it, because I got to drop in, skim some good emotional material, and then sit back and watch it. Now, I have to tell you something about the [stand-in] actor who played the Man in the Iron Mask, which I find remarkable. I asked to meet him, and if you go back and watch the way he uses his hands, he was told to study three actors, and I was one of them. The Man in the Iron Mask can only communicate in the way he uses his hands, and the day that he filmed those scenes, he was told it was me that he was to be imitating. And I was told by everybody that his work was remarkable in that way. It just proves that there are no small roles. Someone who shows that much dedication, my hat was off to him. So yeah, I knew about the Man in the Iron Mask, but I didn’t know where any of that would come down, and I certainly didn’t think it would have anything to do with me. TVLINE | Did any tailoring need to be done to his outfit when you went to assume the role, any adjustments to the Iron Mask? No, that’s just a big ol’ heavy iron mask and it clamps right down. The first time they put it on me, I tried to say something in a normal voice and I almost deafened myself — the reverb in there was like Yow! I was like, “I really hope I don’t have to keep this on very long, because it is so heavy and so claustrophobic.” But it’s very effective — it looks menacing! TVLINE | You recently, finally had scenes with your former 1990s costar, Amanda Pays. What do the two of you make of this new Flash? What do you think? Did you watch the second season finale of The Flash? What would you like to see from Shipp, in the third season? More about: The Flash (2014), The Flash (2014): canceled or renewed?